Habit: Annual, perennial herb, shrub; often glandular; root-parasites, roots modified into absorptive structures. Stem: generally round in ×-section. Leaf: generally simple, generally alternate, reduced to +- fleshy scales in non-green plants lacking chlorophyll; stipules generally 0. Inflorescence: spike to panicle, generally bracted, or flowers 1--2 in axils. Flower: bisexual; calyx lobes 0--5; corolla generally strongly bilateral, generally 2-lipped (upper lip generally 2-lobed, lower lip generally 3-lobed), abaxial lobes outside other lobes in bud; stamens epipetalous, 4 in 2 pairs (sometimes 1 pair sterile), additional staminode 0(1), anther sacs unequal; ovary superior, chambers 1--2, placentas 2--4, parietal, style 1, stigma lobes 0 or 2. Fruit: capsule, generally +- ovoid, loculicidal, valves 2--4. Seed: many, small, angled; surface smooth or netted. Genera In Family: 101 genera, 2060 species: worldwide, especially northern temperate and Africa. Note: High yield losses in many crops caused by Orobanche and Phelipanche species in Africa, Mediterranean, Middle East, and eastern Europe. Taxa of Orobanche in TJM2 treated here in Aphyllon and Phelipanche. Habit: Annual to subshrub, green. Leaf: sessile, entire to dissected. Inflorescence: spike-like; bracts becoming shorter, wider, more lobed than leaves, mature tips generally cream to red or green. Flower: calyx unequally 4-lobed, colored like bract tips; corolla upper 2 lip lobes fused, beak-like, tip open, lower lip reduced, 3-toothed to -pouched; stamens 4, anther sacs 2, unequal; stigma entire to 2-lobed, generally exserted. Fruit: +- asymmetric. Seed: generally +- brown, attached at base; coat netted, net-like walls ladder-like or not. Species In Genus: +- 200 species: especially western North America. Etymology: (Domingo Castillejo, Spanish botanist, 1744--1793) Note: Hybridization and polyploidy common. Biologically consistent taxa difficult to define. Castilleja chrymactis Pennell not in California, sole (1947) record a misidentified, incomplete specimen. Habit: Perennial herb to subshrub, 30--60 cm; hairs woolly, felt-like, much-branched, +- white to +- gray. Stem: much-branched; short, axillary shoots present. Leaf: 10--50 mm, +- linear; lobes 0--3, tips obtuse. Inflorescence: 3--20 cm; bracts 15--25 mm, lobes 0--5, orange-red (yellow-green). 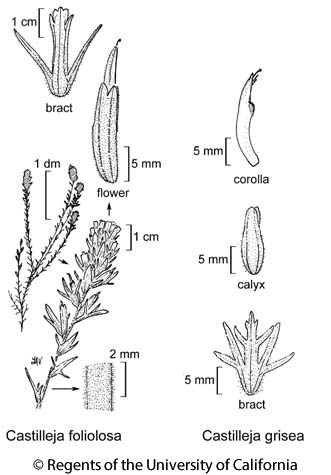 Flower: calyx 15--18 mm, divided 1/3--2/5 abaxially and adaxially, entire or barely notched on sides, swollen in fruit; corolla 18--25 mm, beak +- = tube, exserted, puberulent, margins pale, lower lip 2 mm, dark green, included; stigma club-shaped, slightly 2-lobed. Fruit: 10--15 mm. Seed: 1.5--2 mm; coat deeply netted, most walls ladder-like. Chromosomes: 2n=24. Citation for this treatment: Margriet Wetherwax, T.I. Chuang & Lawrence R. Heckard 2012, Castilleja foliolosa, in Jepson Flora Project (eds.) Jepson eFlora, http://ucjeps.berkeley.edu/eflora/eflora_display.php?tid=18205, accessed on April 22, 2019. NCoR, SNF, CW, SW, sw edge DMoj; Markers link to CCH specimen records. Yellow markers indicate records that may provide evidence for eFlora range revision or may have georeferencing or identification issues. Purple markers indicate specimens collected from a garden, greenhouse, or other non-wild location.